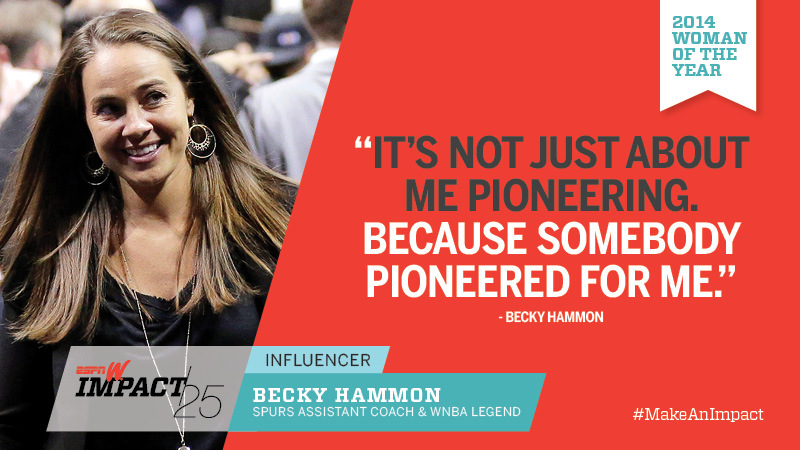 We are continuing to witness history for women in sports with the announcement that Becky Hammon, one of four assistant coaches for the San Antonio Spurs will be head coach of the Spurs’ summer league team in Las Vegas. She’s been steadily upping the opportunities for women athletes ever since her college days. It was big news when the Spurs announced Hammon’s hiring as a full-time female assistant coach in the 2014-15 season. At that time Spurs head coach Gregg Popovich said that “I very much look forward to the addition of Becky Hammon to our staff. Having observed her working with our team this past season, I’m confident her basketball IQ, work ethic and interpersonal skills will be a great benefit to the Spurs.” When looking at the evolution of inclusion in sports, women’s sports really have come a long way in a relatively recent timeframe. Retiring from a successful 16-year playing career in the Women’s National Basketball Association (WNBA), the fact that Hammon landed a coaching job in the NBA was big news! As a six-time All-Star, she played her last eight seasons with the San Antonio Stars, becoming their all-time leader in assists (1,112) and three-point field goals made (493). She also ranks second in franchise history in points (3,442) and games (218) and in 2012 she was the top vote-getter for the Stars All-Decade Team. Even though she was a three-time All-American at Colorado State, Hammon went unpicked in the 1999 WNBA Draft. But she certainly showed that she had what it took to play in the league. In her overall WNBA career Hammon has averaged 13.1 points, 3.8 assists and 2.5 rebounds in 28.0 minutes in 445 regular season games. Along the way she earned All-WNBA First Team honors in 2007 and 2009, and in 2005 and 2008 she was named to the All-WNBA Second Team. Clearly, the woman knows how to play the game. It’s said that she has a basketball IQ that is savant-like. In addition to her knowledge of the game, Hammon was known as a good communicator by her teammates who regarded her as an additional coach. As a Stars rookie, Kayla McBride said that “She knows what to say, when to say it, how to say it.” She added that Hammon “knows I’m a rookie and she knows how to talk to me compared to [a veteran].” But like all trailblazers, Hammon is no pushover. She’s a tough competitor who’s not afraid to speak up. When rehabbing a blown knee in 2013 caused her to cancel playing overseas, Hammon asked Stars coach Dan Hughes if he thought the Spurs would be open to her watching them practice to see if she could improve her game. With an OK from Popovich, her practice observation led to him inviting her to join his staff for film sessions and helping with drills; that ultimately turned into a real coaching internship. So the Spurs’ staff and players already knew and respected her. Of course the announcement of her hiring as an assistant prompted one anonymous coach to bring up the long-held national assumption-turned-belief by many that a woman coach could never be successful since she couldn’t “mold boys into successful men.” But since Hammon would be coaching professional players who one assumes wouldn’t need molding into successful men, it seemed safe to also assume that she could be successful at her new job – helping coach a professional basketball team. And that assumption has proved correct since she’s being given another precedent-setting job for a woman in a man’s professional league. It’s not surprising that the NBA is open to a bright, competent woman in a coaching position. The league has long been a leader in inclusion and diversity. They hired Violet Palmer as a referee in 2006, making her the first female official in a major professional U.S. team sport to achieve the highest competitive level in her sport. And last year the National Basketball Player’s Association (NBPA) hired renowned Washington trial lawyer Michele Roberts as the association’s new executive director. While Roberts has never played the game, she has been a lifelong fan. Growing up with two older brothers and one television, Roberts says she’s been a fan for as long as she can remember. However, the sad fact is that while professional sports are starting to respond to the corporate model of inclusion and diversity, opening the doors for qualified and deserving women like Hammon, Palmer and Roberts, gender progress for women in college sports has continued to trend downward, especially at the college level. In the 2012 inaugural issue of StandUp Magazine, Helen J. Carroll and Ashland Johnson of the National Center for Lesbian Rights (NCLR) wrote an article that asked where the women coaches have gone in college-level women’s sports. Noting that in 1972 women filled over 90 percent of the coaching positions in women’s sports, they said that figure had currently dropped to approximately 43 percent. So far that downward trend continues. Given the slipping numbers of women coaches in college sports, the thought that a woman would be picked to coach a professional men’s team sport didn’t seem to be a real possibility – even just two years ago. Unfortunately, in addition to the assumption that a female can’t coach a male, another of our long-held national assumptions is that male athletes are all macho heterosexuals and female athletes are all lesbians. This erroneous belief has negatively impacted today’s recruiting practices in college-level women’s sports. Even though it’s not legal, many parents who traditionally have felt more comfortable with a male coach molding their daughters into successful women have been subtlety reassured that their children would be “safe” in their sports programs from the influence of gay people. It has negatively impacted the hiring of women coaches and in turn, become the unfortunate institutional norm for many colleges and universities. However, the recent changes in societal attitudes toward the LGBT community in general and LGBT athletes in particular have enabled athletes like Jason Collins, Michael Sam and Brittney Griner to show that they are successful athletes – athletes who just happen to be gay. Fortunately, this growing acceptance of LGBT athletes has also helped open the door for women in sports, both straight and gay, to take their rightful place as athletes, coaches, referees, even high-level executives. Our expanding societal awareness is helping to expand individuals’ awareness that team success comes from qualified individuals, regardless of their gender and sexual preference. The saying, “You’ve come a long way, baby,” is originally the advertising campaign for Virginia Slims cigarettes that were launched back in 1968 and marketed to young professional women during the era of women’s liberation and feminine empowerment. But over the years the advertising phrase has taken on a life of its own. And today it’s often associated with women’s sports, possibly because the brand sponsored the inaugural Virginia Slims tennis tournament in 1970, considered to be the origin of the Women’s Tennis Association founded by Billie Jean King in 1973. While women’s sports have come a long way since the 1970s, thanks mainly to the 42-year influence of Title IX legislation, they have continued to be treated as the lowly handmaiden to men’s sports. WNBA players, for example, must play overseas during the offseason just to survive financially. But times really are changing rather quickly. The fact is that there is now a 42-year history of women athletes who know sports as well or even better than many male athletes because they’ve been able to gain equal access to participate. And the push for inclusion and diversity that started in the corporate world has finally filtered down into the sports world, opening the door to what’s previously been considered a traditional male job. Becky Hammon has broken yet another barrier in the sports world by not only becoming the first full-time female assistant coach in major professional U.S. team sports but also to take on head coaching duties for the Spurs’ summer league. Yes, for women’s sports it’s time to say, you’ve come a long way, baby!